Formed in the Spring of 2006 as a support group for the International Committee for the Peace Council, the Friends of the Peace Council is based in Madison, Wisconsin. The Friends' goals are to increase public awareness of the Peace Council, to raise funds for the work, and to coordinate volunteer efforts on behalf of the Peace Council. Among projects initiated by the Friends are meetings with publishers to promote a book about the Peace Councilors, participation in the Peace Council's International Women's Day Program, exploring the possibility of producing a Peace Curriculum focused on the Council's methods, meetings with potential donors, and a benefit concert. 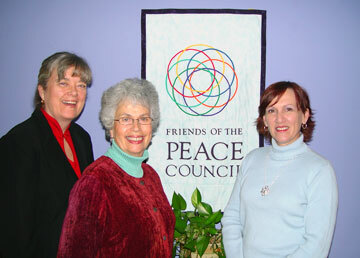 The steering committee of the Friends of the Peace Council (above, l-r): Rev. Jody Whelden, Ms. Linda Joy Knox,and Lay Minister Ms. Deenah Givens.